The past few weeks have been Homecoming season, at high schools and colleges in the area. My friend Mike and I visited both of our alma maters, Clarke and Loras, on their shared homecoming weekend recently, and my own campus celebrated Homecoming last week. While college homecomings can be fun, in my experience nothing tops Homecoming Season in high school! 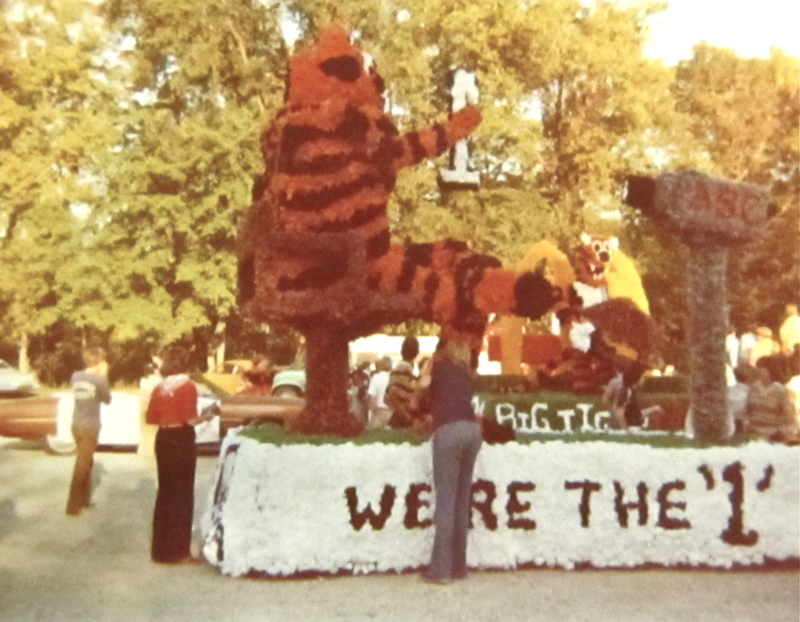 The photo, above, is an entry in Loveland Hurst High’s annual Homecoming Parade class float contest. Each year, one classmate’s family loaned us the use of their barn for the two weeks leading up to Homecoming. We would design, then build on a flat-bed trailer, the wood and chicken-wire frame for our float. Then the mad dash to completely cover the float with tissue-paper “flowers” began. Many after-school hours were spent poking, fluffing, stapling. Sometimes only a handful of us showed up, other times it seemed like our whole class was there. Astonishingly, some of these floats, created and built by high schoolers, actually had moving parts. They held together (mostly) on the miles-long trip from the build-site to the parade route. (That drive was so slow and nerve-wracking, as we worked to avoid any mishaps and prayed we would make it under any electrical wires and overpasses.) Once at the parade site, we cheered our own floats until we were hoarse, always convinced – even if our better selves whispered otherwise – that OUR FLOAT should win the contest. Its funny, but I don’t remember Homecoming being about alumni coming home. I do remember it being an annual time when, as an awkward teenager, I felt very much at home in my place, my high school. May we all experience that sense of Homecoming this fall!